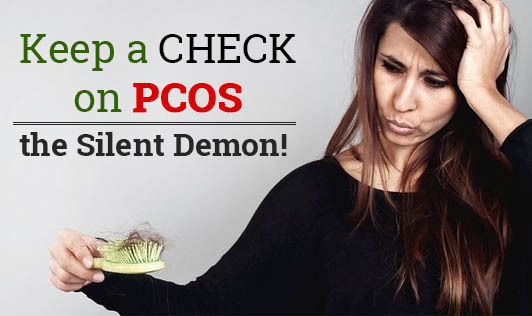 Keep a Check on PCOS - The Silent Demon! Do you suffer from extreme mood swings or acne or hair fall or sudden weight gain??? Then it is time you check for this silent demon- PCOS. Every fourth overweight female client I talk to says she has severe hormonal fluctuations and each of them have different symptoms to share. Poly cystic ovarian syndrome (PCOS) is a complex condition in women where there is an imbalance in the female hormones. This imbalance in hormones result in development of cysts inside the ovaries and the eggs may not be released regularly. A few women show up with the below mentioned symptoms and a few don't. • Acne, excessive hair growth and male pattern of balding due to increased levels of testosterone, the male hormone. • Sudden weight gain with central or apple shaped obesity. • Velvety thickening and pigmentation of the skin, especially around the neck, armpits, groin, below the breast, and of the elbows and knuckles due to increased insulin resistance. • Irregular menstrual cycles with very heavy or very light bleeding. • Trouble getting pregnant (infertility). The precise cause for this condition is still unknown. However, it does run in your genes. Abnormal production of androgens and estrogens are known to cause PCOD. A lack of insulin sensitivity leads to an increased secretion of insulin, thus increasing the levels of fats in the blood causes PCOD. PCOS is diagnosed through a physical examination of the pelvis or you will be asked to undergo tests for diabetes, blood pressure, cholesterol, estrogen level, FSH level, LH level, testosterone level, thyroid function test etc based on the symptoms you show. With the advancement in the medical field, you need not worry about the treatment given for PCOD. You will be treated according to your symptoms. But, you have a major role to play in correcting your PCOS condition. Head towards a healthy lifestyle by choosing a balanced diet and exercise regularly. Studies show that losing just 5% of your body weight will improve your chances of getting pregnant. Isn't that great news? Then set your goal today!! !